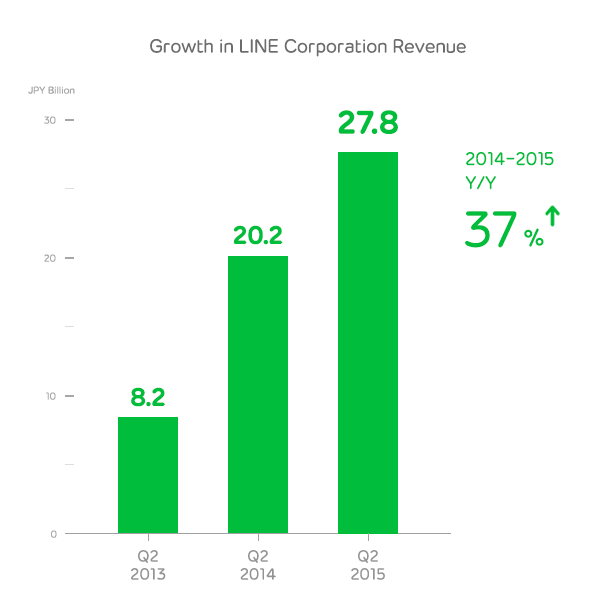 Tokyo, Japan – July 30, 2015 – LINE Corporation, owner and operator of the free call and messaging app LINE, today announced their Q2 (April-June) earnings for 2015. LINE Corporation’s revenue* for the quarter was JPY 27.8 billion, an increase of 37% over the same quarter in the previous year. The revenue for LINE Corporation’s core business, LINE, totaled JPY 25.3 billion in the second quarter, an increase of 39% over the same quarter in the previous year. *Consolidated performance including subsidiaries such as LINE PLUS Corporation and LINE Business Partners Corporation. The Monthly Active User (MAU) count for LINE (as of June 2015) totals 211 million globally. With the recent rapid acceleration of user growth in Indonesia particularly noteworthy, the number of new users and MAU continue to grow across the globe. In the Sticker business, official stickers and creators' stickers continue to perform strong. Official stickers with sound have been well received and are experiencing growing sales in their initial market of Japan as well as Thailand and Taiwan, where they been recently introduced. The LINE Creators Market, a platform that allows users to sell and buy stickers created by other users and that celebrated its first anniversary in May, continues to expand, with total sales of creators’ stickers now reaching JPY 8.94 billion and the top ten creators earning more than JPY 100 million on average. LINE has also released LINE Creators Management, a service that further expands the options open to sticker creators by helping top-selling creators merchandise and manage the rights of their products. LINE GAME released six titles in the second quarter of 2015. LINE Bubble 2, a bubble-shooting game launched globally in April, continues to show steady growth in user acquisition and sales with an aggressive marketing campaign that has included the airing of TV commercials in Japan this July. As it continues to expand both in Japan and overseas, LINE is actively investing in game content developers through its “LINE Game Global Gateway” investment fund. In the second quarter LINE invested in three projects/companies, including social and smartphone app developer TriFort, Inc. (Headquarters: Shibuya, Tokyo; Representatives: Yasuaki Omata/Shintaro Otake). LINE will continue to provide new titles in a wide variety of genres that cater to the needs of regional markets as it aims to further expand the user base of LINE GAME and accelerate sales. LINE is also experiencing growing sales for its respective advertising services, with the number of official accounts growing robustly in Thailand, Taiwan and Indonesia. LINE has also began enabling advertising via the video distribution service LINE TV in Thailand, and LINE Business Connect, a business-oriented API that includes many of the features of LINE official accounts while offering a high degree of customizability for companies, is attracting attention from many corporations—the service has been successively employed by a power company for customer inquiries regarding moving procedures, by a real estate company to support property listing searches, and other companies for product promotions. LINE is also constantly introducing new advertising services, such as the “LINE Must-Buy Coins” incentive program, which provides coins that can be exchanged for stickers, themes and other virtual goods to users that buy a certain product, visit a certain store, or fulfill other specific conditions. LINE continues to drive ahead with its LIFE Platform Strategy, with the aim of making LINE a company that provides content and services that are even more integral to modern people’s lives. The on-demand music subscription service LINE MUSIC has been well-received since its launch in Thailand and Japan, with more than 6.2 million downloads in its first month of availability in the latter. As of May 2015, LINE’s dedicated selfie camera app B612 has topped 50 million downloads worldwide, thanks to remarkable user growth in both Asia and Latin America. LINE also continues to develop new LIFE Platform content and services, such as the recently released LINE Lite, a smaller-than-1MB lightweight version of the app that promises to make rich communication accessible even to users in areas where network infrastructure is less developed or lower-end smartphones are more widely used, thereby enabling LINE to attract users from an even wider demographic globally. One of the key phrases for our 2015 business strategy is “global expansion,” and as we have focused on seizing the leading market share in countries around the world—particularly in Asia—our full-scale localization efforts have recently shown the most remarkable success in Indonesia. As we continue our activities to ensure a leading position in Indonesia, we will also apply the user acquisition know how we have fostered there, as well as the provision of LINE Lite and other services, to increase our market share in new regions and accelerate our global expansion. Aspiring to become an integral platform for the everyday life of all users through both current and new services, LINE will develop a variety of new business models, establish new paths for growth, and increase the convenience provided to its users, all while moving at a faster rate and on a larger scale than ever before. Note: This document has not been checked by a third party auditor. All figures were calculated internally.